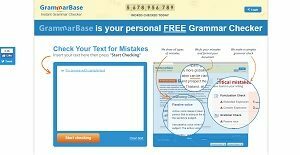 Grammarbase is an online grammar reviewer and corrector. The technology thoroughly checks for virtually all kinds of grammatical errors and contextual mistakes, as well as incorrect spelling and plagiarized content. Grammarbase works by pasting the unedited text directly into a box on the website. The application will then begin scanning the content in real time. After a review is completed, users will receive a free detailed report noting all errors, with suggestions on how to correct or improve the text. Grammarbase can be used by practically all types of users – from freelance writers, to teachers who want to verify the originality of work submitted by their students, to employees of companies who want to ensure proper grammar and spelling in their corporate documents. The free-to-use automated service even provides a premium option for those who prefer manual proofreading of their materials. Word processors are notorious for overlooking or mixing up grammatical and spelling mistakes. This is because most of them do not take contextual errors into account. As a result, it is common for a misused word to not be flagged simply because it was technically spelled correctly. Grammarbase avoids these lapses as its spelling checker provides a more comprehensive scan, ensuring that a document uses only the correct words to convey the right idea. Aside from intuitive spell checks, the application’s grammar checking capabilities are extensive so that users can be sure that all kinds of grammatical errors are considered. This includes pointing out the improper use of modifiers, prepositions, punctuation, quantifiers, and more. Grammarbase is ideal for individuals who are trying to learn the English language, as it tends to get tricky to master due to its many nuances. Users simply need to input text into the application so that they can identify their errors and significantly improve their English with continued use. Aside from Grammarbase’s standard services, the application’s Proofread option offers manual polishing of documents. The premium option guarantees that all mistakes in a user’s paper will be eliminated and can be submitted in as little as 3 hours. Since Grammarbase is hosted online, users can access the application anytime and anywhere they need to. Its straightforward design and ease-of-use also helps make writing processes fast and hassle free. If you are interested in Grammarbase it may also be beneficial to analyze other subcategories of Best Grammar Checker Software listed in our database of B2B software reviews. It is important to realize that hardly any service in the Grammar Checker Software category will be an ideal solution that can meet all the needs of different company types, sizes and industries. It may be a good idea to read a few Grammarbase reviews first as certain services may excel only in a really narrow set of applications or be designed with a very specific industry in mind. Others may operate with an idea of being simple and intuitive and consequently lack complex features needed by more experienced users. You can also come across software that cater to a wide group of users and provide a complex feature set, but that usually comes at a higher cost of such a solution. Be certain that you're aware of your needs so that you purchase a service that offers specifically the features you look for. How Much Does Grammarbase Cost? We realize that when you make a decision to buy Grammar Checker Software it’s important not only to see how experts evaluate it in their reviews, but also to find out if the real people and companies that buy it are actually satisfied with the product. That’s why we’ve created our behavior-based Customer Satisfaction Algorithm™ that gathers customer reviews, comments and Grammarbase reviews across a wide range of social media sites. The data is then presented in an easy to digest form showing how many people had positive and negative experience with Grammarbase. With that information at hand you should be equipped to make an informed buying decision that you won’t regret. What are Grammarbase pricing details? What integrations are available for Grammarbase? If you need more information about Grammarbase or you simply have a question let us know what you need and we’ll forward your request directly to the vendor.